All students are welcome to join Health Promotion and Wellness in 20 IM Building for wellness activities. The wellness suite is a great space for students to unwind and relax. Enjoy Yoga, coloring, meditation and much more. 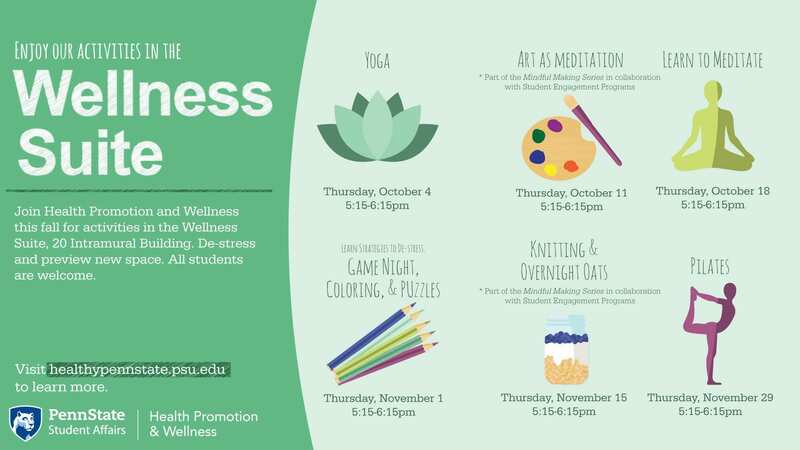 Bring a friend and let’s de-stress, Thursday’s 5:15-6:15 p.m.
October 4 – Yoga 5:15-6:15 p.m.
October 11 – Art as Meditation 5:15-6:15 p.m.
October 18 – Learn to Meditate 5:15-6:15 p.m.
November 1 – Game night, coloring and Puzzles 5:15-6:15 p.m.
November 15 – Knitting and Overnight Oats 5:15-6:16 p.m.
November 29 – Pilates 5:15-6:16 p.m.